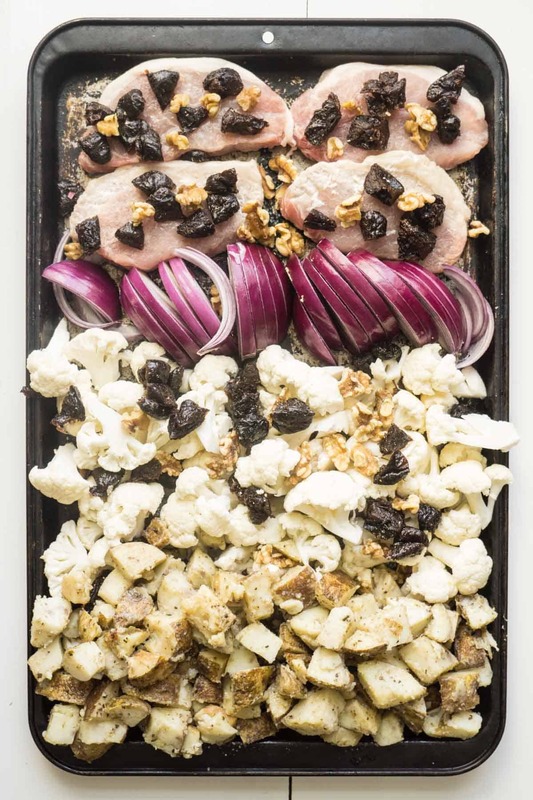 This sheet pan dinner combines pork and dried plums with onions and walnuts, in a quick and easy fine dining experience with a hidden agenda: bone health! I want to talk about this delicious sheet pan dinner. I really do. It’s got pork, dried plums, walnuts, onions, and it is my favourite thing right now. But first, we need to talk about how it supports bone health, and why that’s so important. If you’re under 30, preventing a hip fracture in 40 years is probably not on your radar… but it should be! You have the best opportunity for future-proofing your bones right now! When you’re born, your body starts to build dense, strong bones. But it’s programmed to stop building bones and enter a maintenance phase at a certain age. At what age do you think your peak bone mass starts going down? 70? no… not even close! 40? no… not quite there yet! If you’re over 30… don’t worry, there’s still lots you can do to help maintain the density of your bones, so that they don’t decrease! Calcium has been the darling nutritional poster child for bone health for years now. Our bones are largely made of calcium and magnesium minerals, so while these are certainly necessary for building bones, they’re not the whole story. Think of it like this: If you’re building a bookshelf, you need some building materials. Calcium and magnesium are your pieces of wood. But, in order to make the shelf, you need to get the wood into your room! Vitamin D is a key mineral for helping your body absorb calcium. To build the shelf, you need the right tools, like a saw and hammer. Vitamin K is needed to synthesize new bone. It would be hard to build the shelf if someone kept walking off with your wood! You need a security guard. Boron helps to prevent the kidneys from excreting too much calcium. In the first few years after menopause, a dramatic withdrawal from the bone bank occurs. At this time, women may lose up to 20% of their bone mass! Again… it’s not all doom and gloom! 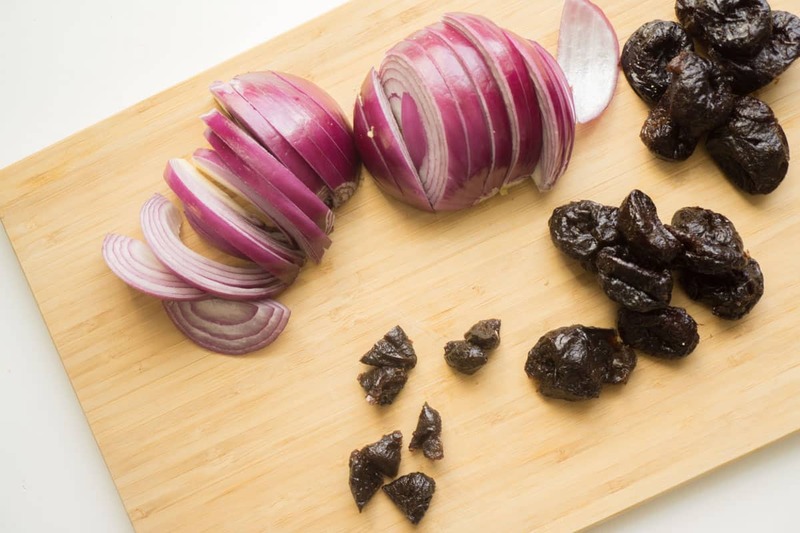 A recent study by the California Dried Plum Board have shown that when post-menopausal women eat 5-6 prunes a day, they preserve their bone mass! Read more about the study here. While we don’t yet have any research on young humans, studies conducted on animal models show that prunes can also increase peak bone mass in the growing years as well! Talk about unlocking the potential of food! This recipe was developed through a sponsored collaboration with the California Dried Plum Board. However, all opinions are mine! Dried plums, or prunes, contain a cocktail of nutrients known to benefit bone health: Vitamin K, boron, copper, manganese, and polyphenols such as chlorogenic acids and proanthocyanidins. Researchers haven’t been able to isolate which of these nutrients is responsible for improving bone health – they actually believe that they may all work together! But onions and walnuts are also great for your bones! Onions: In one study, post-menopausal women who ate onions everyday had a 5% higher bone density than those who only ate them once a month or less. Like prunes, the whole onion package may explain this particular health benefit. The fructans, sulfur content, and anti-oxidant power of onions may all play a role in keeping bone mass. Walnuts: There is some preliminary evidence that alpha linolenic acid (ALA), a type of omega 3 fatty acid found in plant foods such as walnuts, may be bone protective! Data from the infamous Framingham study reveal that those who had the highest intake of ALA had a 54% lower risk of hip fracture over 11 years! there’s something about those sheet pan dinners…. So yes, this recipe is good for your bones, but another obvious benefit of any sheet pan dinner is right there in the name: there’s just the one sheet, so it won’t give you dishpan hands. The biggest benefit for this specific recipe though, is that this is one of the tastiest meals I’ve had in recent memory! The magic in this particular sheet pan dinner is a combination of a) the sauce and b) the oven. Roasting the veggies brings out their natural sweetness. Try to bake them just long enough that they start to crisp up slightly… without burning. Roasting veggies is a bit of an art form, and takes some practice. Don’t worry though: it will still be delicious if you don’t get it just perfect. There’s a margin of error. And that sauce! That glorious sauce! It’s like a spiced honey garlic sauce… I’m absolutely loving the subtle flavour of cloves. It’s just enough to give this sauce a unique flavour without being overwhelmingly clove-y… know what I mean? Want more one dish dinners? Check out balsamic chicken and veggies, Thai yellow chickpeas and potatoes, and this peach chutney samosa stew. 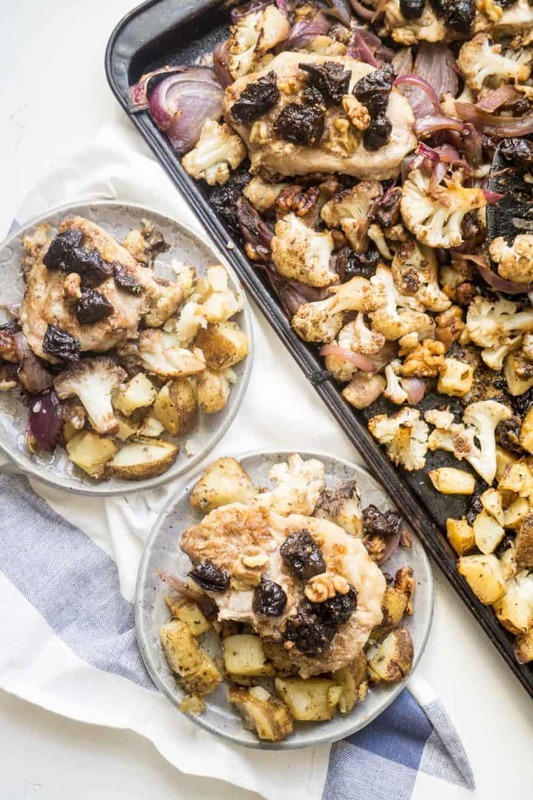 This sheet pan dinner combines pork and plums with onions and walnuts, in a quick and easy fine dining experience that’s incredibly good for your bones! Melt the honey in a glass jar in the microwave. Add the remaining sauce ingredients and stir to combine. Place the pork steaks into a plastic zip bag. Pour 1/3 the sauce into the bags to marinate the pork. 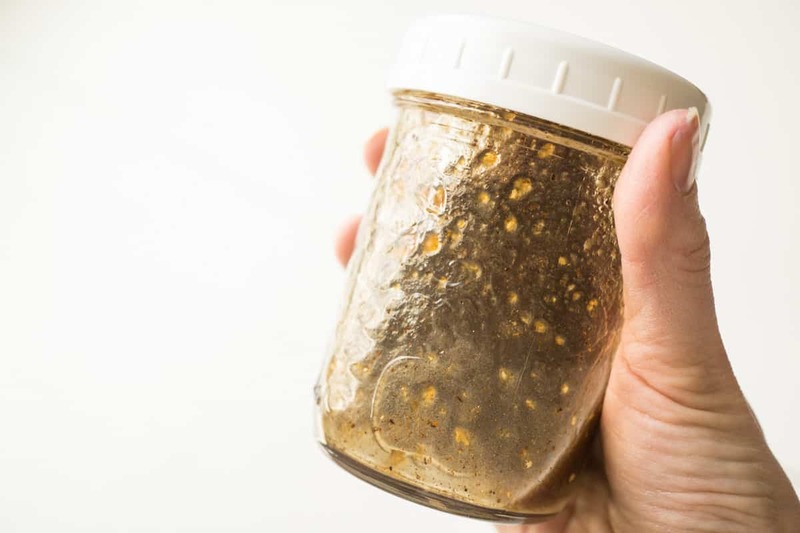 Place in fridge an marinate a minimum of 30 minutes or up to 24 hours. Drizzle with the remaining sauce. Place the pork steaks and marinade on top of the veggies. Bake 10-15 minutes or until a meat thermometer inserted into the center of the pork reads at least 145 degrees Fahrenheit. Baking time will depend on how thick the pork is cut. 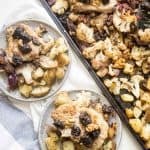 If you make this sheet pan dinner recipe, please let me know! 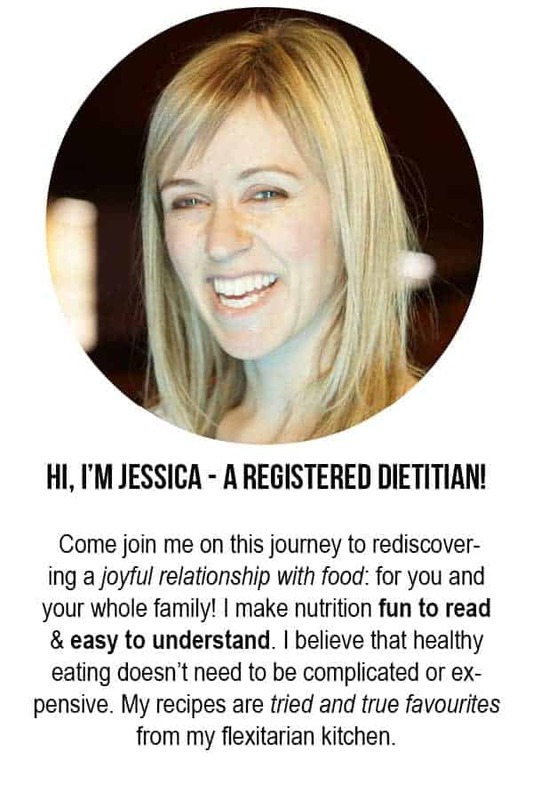 Leave a comment, rate it, or snap a photo and tag it with #smartnutritionrecipes on Instagram! I’d love to see your creations! Me too! I remember my mom eating them as a kid and I always thought they looked like beetles. But then one day I got up the nerve to try one and discovered how delicious they are! I ended up eating a few too many that day (if you know what I mean!!! ).